Human hair gets greasy when it is not washed enough, but some people naturally have oily scalps, even if they shampoo frequently. 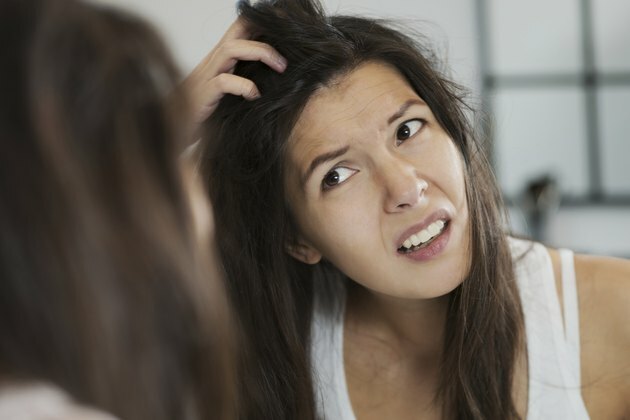 This can lead to a condition called seborrheic dermatitis, more commonly known as dandruff, according to the National Institutes of Health, or NIH. Other things contribute to the problem, but an oily scalp is a common factor. Dandruff is characterized by oily skin patches, redness, itching, skin lesions, scales and hair loss, according to NIH. Its most readily identifiable symptoms are itchiness and white skin flakes that get stuck in the hair and eventually fall off onto the shoulders, but the other symptoms can happen in severe cases. It is usually limited to the scalp but can spread to the eyelids, eyebrows, lips, nose creases, ears and skin folds on the body. Many dandruff sufferers produce an excess amount of skin oil, NIH explains. It combines with malessizia, a yeast commonly found on the scalp, and irritates the skin. People who do not wash their hair regularly can also develop dandruff because dirty hair gets greasy. The CNN Health website states that men are more prone to dandruff because they have larger oil glands on their scalps. Other contributing factors include heredity, fatigue, stress, obesity and other skin problems like acne. People who have had strokes or head injuries and those who suffer from Parkinson's disease and HIV are also more likely to get dandruff. People with naturally oily scalps may suffer with dandruff throughout their lives, although NIH states that it can be controlled with regular maintenance treatment. It sometimes disappears for several months or years before reappearing. Dandruff treatment involves regular shampooing with a medicated product. This serves two purposes. It ensures the hair is clean, which cuts down on scalp oil, and attacks malessizia with yeast-fighting ingredients. NIH recommends daily use of a shampoo with salicylic acid, resorcin, ketoconazole, selenium, zinc or coal tar as the main active ingredient. The shampoo should remain on the scalp for five minutes while the skin is massaged to loosen the flakes. Medicated lotion is available for body dandruff. A good maintenance program helps keep dandruff from recurring. Wash hair daily to prevent excess oil build-up. NIH explains that people who are prone to dandruff can use a medicated shampoo twice a week and a regular product on the other days. They should also avoid greasy or sticky products like styling gels, mousse and hair spray, according to CNN Health.